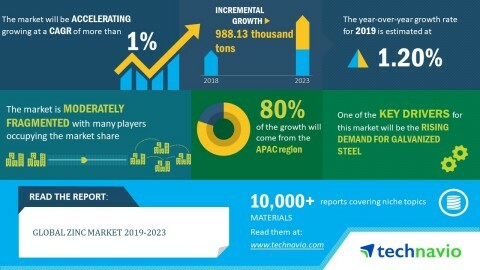 Technavio has announced the release of their research report on the global zinc market for the forecast period 2019-2023. This global zinc market analysis report segments the market by application (galvanizing, die casting, brass and bronze, and others), end-users (construction, transportation, consumer goods, and others) and geography (APAC, Europe, MEA, North America, and South America). “The APAC region will register a faster growth rate during 2019-2023. The growth of end-user industries such as construction, automotive, and consumer goods in the region will have a positive impact on the zinc market in the region. APAC currently holds the largest share in automotive production and is expected to continue its dominance over the forecast period. In Europe, the increase in the production of passenger vehicles is driving the demand for zinc. Renovation and modernization of buildings in the region will also drive zinc market growth”, says an analyst at Technavio.